In 2010 the museum purchased the Spanish-American War uniform worn by Sergeant O.G. 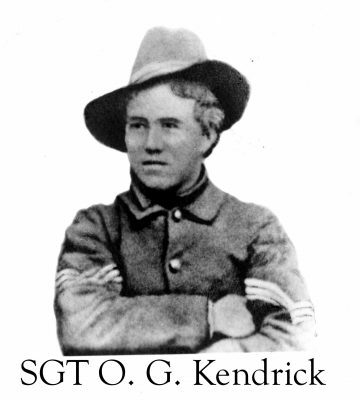 Kendrick, a member of Company M, 2nd Arkansas Volunteer Infantry.. 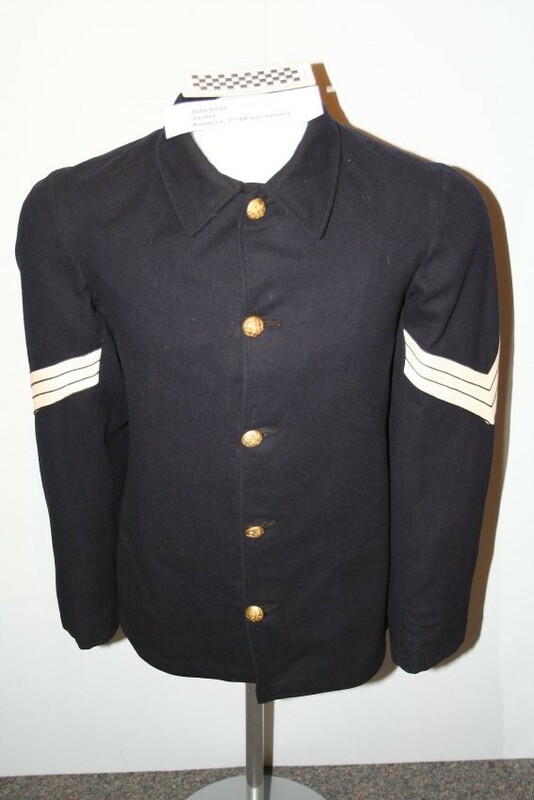 The uniform consisted of three pieces, the outer blouse, the pants and a three-button pullover work shirt. The museum had the blouse restored and the other pieces cleaned. The pictures above are of SGT Kendrick in the uniform and of the restored blouse. Shortly after I became 17 years of age, I enlisted in Company L, Arkansas State Guards, which was being organized at Melbourne by my oldest brother, William Richard Kendrick. On April 18, 1898, this company was called into Federal service. Forty five members of Company L enlisted to go into this service in the United States Army. So we were joined at Melbourne, Arkansas by Honorable Jerry C. South with 18 men from Mountain Home, Arkansas, they having marched the entire distance of 50 miles from Mountain Home to Melbourne. Then the combined force marched the entire distance from Melbourne to Cushman, Arkansas, a distance of 22 miles, with an overnight stop at Mount Pleasant. Our march created great excitement all along the route. A great demonstration was held by the people at Mount Pleasant in the Public School building the night we stopped over there. Patriotic speeches were made and we picked up several recruits there. The same feeling prevailed at Cushman next day when we arrived there. Citizens had prepared to give us a bountiful mid-day feast of excellent food which we all enjoyed very much. Cushman being our nearest railroad point we entrained there for Little Rock, Arkansas, which point we reached on April 30, 1898. On May 10, 1898 we were mustered into the service of the United States Army at old Camp Dodge located in the Eastern outskirts of the city of Little Rock. We became Company M, 2nd Arkansas Volunteer Infantry. The regiment was mobilized at Camp Thomas, Chickamauga park, Georgia, having arrived at this camp May 30, 1898. The regiment was assigned to the 2nd Brigade, 2nd Division, 4th Army Corps. Fully armed and equipped we were drilled several hours each day all through the long hot summer months of that year. More than 75,000 men were stationed at this large camp. Sanitary conditions were terrible. The soldiers suffered from malaria, typhoid and other fevers. There were some cases of smallpox. My company made the highest score on target range among the 75 regiments competing. We were named “Highland Sharpshooters” by the commanding general of the camp, General C. T. Breckinridge. On September 9, 1898, our regiment was moved from Camp Thomas to Camp Shipp, Alabama, where we went into winter quarters. We were located a few miles from the city of Anniston, Alabama in the foothills of the mountains and we had much better health there than we did at Camp Thomas. On February 25, 1899, I was mustered out of the regiment at Camp Shipp and returned to my home in Melbourne, Arkansas.